Oh boy do these ever look so good! Might have to substitute the peanut butter with some sunbutter though. Will be making these this weekend! Thanks! Try using WOWBUTTER i have a peanut allergy and my fiance says it tastes almost identical to peanut butter and has more protein! Yes we use it all the time as we have 3 people with nut allergies. Oh my. Looks great and sounds great. Ingredients to help with lactating for a breastfeeding mommy! I can’t wait to try making these tomorrow! 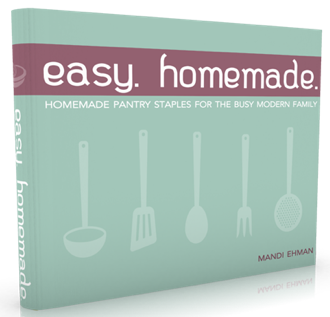 It is so quick and easy. And since I’m a breastfeeding momma too I will pass on the yummi goodness to baby! This can Be GF TOO! SUPER yummie sounding. Will be something we try! I have lots of Bobs Red Mill Granola that I bought when I found a great sale on it. Well needless to say no will eat it but me. Do you have a recipe for bars or bites that I could maybe incorporate it into so as not to waste it. They all love granola bars just not the cereal. Either one should work with the Bobs Red Mill Granola. Don’t make the same mistake I did and try to stir in the chocolate chips before pressing in the pan. They melt and don’t get distributed evenly. 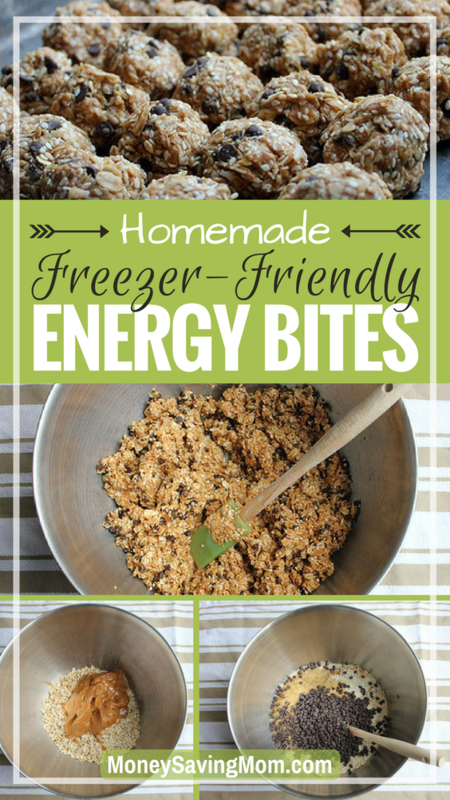 I make these Energy Bites all the time for my boys. I noticed you’re using less honey than I do (Maybe I was doing the math wrong?) which I need to start doing. I wasn’t going to make them for awhile because they’re so sweet. Love this recipe, I make it all the time! Today I subbed almond meal for the flax… Divine!!! I may make that change all the time. Hi there, Visiting you….from Blog talk Radio…then Facebook and now Im here! I am allergic to nuts so I wonder how you’d substitute? I made some of those and they are SOOOO yummy! Bet your little ones will LOVE them! Hello deliciousness! I’ve got flaxseed in the freezer. I’m so trying this very soon. We made these and my son kept asking when we were going to bake them. He thought they should be baked like the cookies we made earlier in the week. When we had the energy bites done I let the kids sample them. At first my son made a funny face. I think he was still thinking I was forgetting to bake them. But once he tasted them he really liked them. The rest of us all liked them quite well too. I have never thought of grinding my own flax seeds, I always buy them already ground but I bet they would have more nutrition left whole longer. I have made these before, they are good! Actually, they are not digestible in raw form, so grinding is good. 🙂 They do, however, store in the frig or freezer longer if left whole. I am def. trying these out soon. 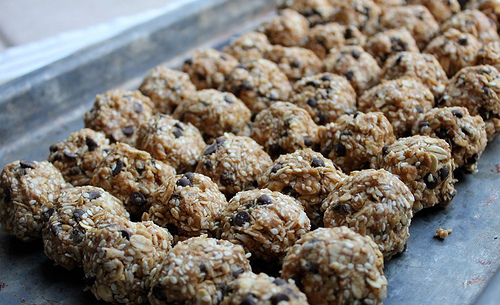 I couldn’t believe how yummy these are while containing such good for you ingredients. What a great treat to take camping/hiking for a burst of energy! “good for you ingredients” – well, mainly, but there’s chocolate chips! Looks similar to the homemade granola bars Andrea makes at simpleorganizeliving.com. Delish! Hi — does anyone have a nutrition analysis for these and other high-protein treat/bars/snacks? My 17-year old son is a swimmer and water polo player and needs to eat 5000 calories and 200-225 gm protein a day. He needs the nutrition, but my wallet needs some RELIEF! 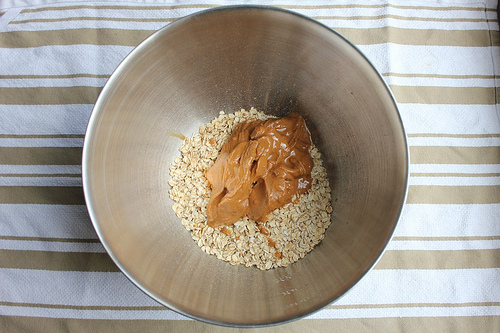 Putting the recipe into the CalorieCount.com recipe analyzer, using wheat germ, it comes to 157 calories, 8.2 grams of fat, 3.4 grams fiber, and 5 grams of protein per ball. With sesame seeds, it makes it 179 cals, 11.5 grams of fat, 3.3 grams fiber, and 4.6 grams protein. Thanks for the tip! I was dreading the search for mini-chocolate chips, but if I melt them I can use the regular ones I have on hand! I found these on smashed peas and carrots last year, and started making them. My hubby and boys loved them. My boys wanted them for football all the time. The team loved them too! I.love.these! Especially straight from the freezer!!! My recipe has a little bit of cinnamon in it, too. And I use crushed graham crackers as well. They are awesome! I made those a while back. Very yummy! I just finished out some burritos and enchiladas as well as some taco meat. Where do you get flaxseed? You can get it at the health food store, on Amazon.com, or probably even the grocery store or Walmart. Okay, I didn’t see any at Wal-mart last week. My Walmart has it, it’s in the baking section with all the Bob’s Red Mill stuff. I buy it already ground from Trader Joes. I use the Bob’s Red Mill brand. I store it in the fridge once opened. Publix sells it in their bulk section, too. My freezer cooking turned into desperate dinner. Any tips on getting my 6 month old to nap? We don’t have a health food store anywhere close so I’ll check in the next town at Publix for the flax seed. I hope they have it already ground because I don’t have any type of grinder or food processor. Thanks everyone I can’t wait to try these! I’d say to replace the flax seed with something else (wheat germ, more oats, or even flour) instead of making a special trip to go buy some. I don’t even use flax cause I never have it. I grind up almonds instead. Tastes awesome! thank you. . . . I will! I second Crystal’s suggestion – flax seed is really great for you but only if it’s ground. I have a Hamilton Beach that just happened to be a freebie that came along with a coffee maker and I actually like it much better than the more expensive brands I have owned. Most important thing: make sure you get one that comes apart for washing! That way if you use it to grind spices, seeds, coffee, etc… it won’t flavor your next project. With my old ones, only the lid was submersible for washing. The actual bowl/blades could only be wiped out and it was hard to get it all clean. One thing I’ve discovered that is SO helpful when making these…instead of spending all that time rolling out a hundred little balls (it takes me forever), I dump the whole mixture into a foil-lined 9×13 baking pan, press it down as if I were making granola bars, stick it in the fridge for and hour or so, then lift out the foil and cut them into little squares. SO MUCH FASTER! I wish I came up with this trick a long time ago. You still get the little bites, but it’s a lot easier to cut little squares than rolling little balls. Plus, your hands don’t get messy. YAY! Is there another good way to grind up whole flaxseed if you don’t have a grinder? Would a food processor or blender work? Any idea how long these store not in the fridge/freezer? I’m a runner and these sound like a great snack to take on a long run, but only if I’m not going to end up with a gooey mess two (or more) hours in! Jacqui, if you freeze them before your run, I bet they’d be the perfect consistency by the time you need them. IN my experience though, they’d likely be messy if you didn’t set out with them frozen though. I found that recipe several months ago and I’ve made it MANY times. But I’ve never tried freezing them. Thanks for the suggestion! I love that the recipe is so versatile. 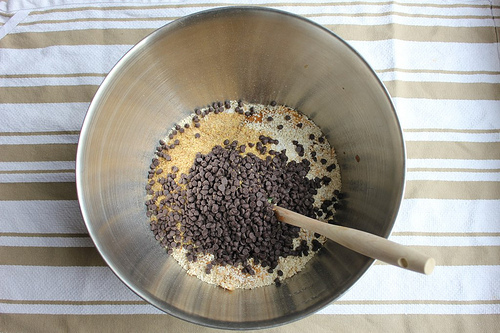 One change I’ve liked is substituting carob chips for half of the chocolate chips. I also reduce the honey a bit, because it’s almost too sweet with all the honey. 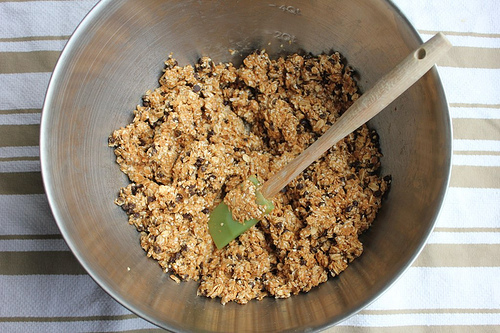 I’ve also tried pressing the mixture into a 9×13 pan and cutting them into raw granola bars. I was thinking about making them into bars as well. Do you cut and freeze them once they are all set in the pan? Just wondering, do you use the old fashioned rolled oats or the quick cooking oats?. Also, my daughter can’t eat flax…any ideas on substitutions for this part? I would like to know too. I can’t tell if they are the old fashioned or quick oats from just looking at the picture. I use old fashioned, but quick oats work, too. I wish there was a diabetic-friendly version of something like this… chocolate chips and honey sound SO GOOD!! I made these yesterday and they do taste good, but were SOO crumbly. they wouldn’t roll into balls. I had to squeeze them very hard to get them to adhere at all. What am I doing wrong? I followed the recipe with all the right measurements. I have found that if I use natural peanut butter (even the no-stir kind) they end up kind of dry. Were you using a natural PB? Using the other kind seems to kind of defeat the purpose of a healthy snack, wouldn’t it? Any ideas? I haven’t figured out an alternative yet, I just know I’ve made them with both and the natural version was more crumbly. Perhaps trying the technique mentioned in a post above of melting the chocolate and PB and then adding the other items? Haven’t tried that yet, but maybe it might help? Or adding a bit of a healthy oil? Anyone? Try adding a bit of water. Did the trick for me. I usually skimp on the sweetener and this does the trick, especially with the flax seed. I loved making these! I had everything on hand, didn’t even need to do any cooking which made it doubly awesome in my book. The energy bites are now on my to-try list! Uh, YUM! That’s all I can say. These are incredible! I have them hidden in the freezer, and can sneak 1 or 2 when no one is around. They are super easy to make, and I even had all of the ingredients on hand. I added dried cranberries as well, and they are just delicious. Thanks for the excellent recipe, and keep em coming! 2 cup coconut flakes, wheat germ, sesame seeds, or a mixture of all three (can also substitute oatmeal or protein powder, if you prefer)—-do you mean 2 cups of each of these ingredients??? Or a 2 cup mixture? Sorry, I have never made anything like this before, but am looking forward to it. A two-cup mixture. I hope that helps! Instead of rolling these into balls, I dump the mixture into the plastic insert from a cereal box. Then I roll it out with a rolling pin (so now I have a big rectangle the size of the plastic lining). I gently open the plastic lining and use a pizza cutter or knife to cut little squares. I fold the plastc back over and place the whole rectangle in the freezer or fridge. This method is a lot faster than rolling balls. I made these for our church luncheon today and they were a HUGE hit! Everyone loved them (even the pickiest kid!). i love these! 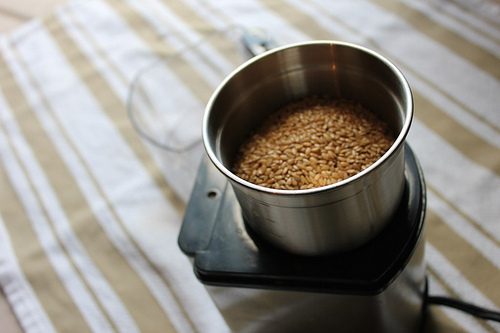 where can you find a decent amount of sesame seeds? my grocery store only had them in small containers in the spice aisle, and it was not very cost effective. is there somewhere you can buy them in larger quantities? This may be a silly question but is Caro syrup a substitute for honey? I have Caro left over from another recipe and I just ran out of honey making granola bars. I tried to find the answer to my question in the comments section, prior to asking, but I can’t seem to. If you don’t grind them, you might as well leave them out as your body can’t receive nutrition from whole flax seeds. These are one of our very favorite snack recipes! Thanks for sharing! Awhile back I also adapted her recipe into a Paleo version, and it’s been very popular on my blog. You can check it out here: http://www.mommade.org/2012/01/recipe-paleo-snack-bites.html. Sorry – silly question. What type of oatmeal do you generally use? Also, is the oatmeal cooked or uncooked? I am so excited to try these but I was wondering how long they will keep in the freezer (like a best by date). From the other comments it looks as though these may be gone before I have to worry about them going bad but just in case.